Matt McGrath Bangs His Global Warming Drum-But Is Anybody Listening? You would think Matt McGrath would get fed up with writing “we’re all gonna die” articles every week! After all, most people now longer pay any attention to his incessant propaganda. In true BBC fashion, however, there are a lot of things that McGrath forgot to tell us, which would show that things aren’t quite as black and white as he would like you to think. This claims to represent temperature anomalies, calculated against a baseline of 1951-80, three of the coldest decades of the entire 20thC. 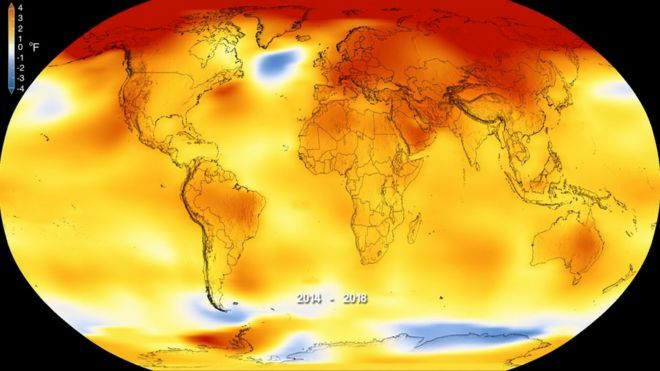 In reality, however, there is no temperature data whatsoever for vast areas of the world, and NASA, who published the map, simply make up temperatures to fill the missing gaps (grey below). Note also that red swathe across the Arctic, intended to persuade us it is burning up there. NASA, NOAA and the Met Office have virtually no data at all anywhere in the Arctic Circle, other than a tiny handful of sites around the edge, at least some of which are affected by UHI. It is scientifically well accepted that you cannot use these land sites to derive surface temperatures across the ice filled Arctic Ocean. Yet that is exactly what NASA and co do. But let’s take a look at the longer term trends in Arctic temperatures, according to the Met Office Hadley Centre. Bear in mind that 1951-80 baseline that NASA and the BBC are trying to persuade you is the norm. As you can see, temperatures back in the 1930s and 40s were similar to now, but declined sharply in the 1960s and 70s. We keep being told that Arctic temperatures are rising faster than the rest of the world because of global warming. But the rapid rise since 1980 is nothing more than a cyclical phenomenon. In contrast to the sparse surface coverage, satellite data offers a much more complete picture of atmospheric temperatures. And these show that the temperature last year was nowhere near being a record , and was barely higher than 2002. 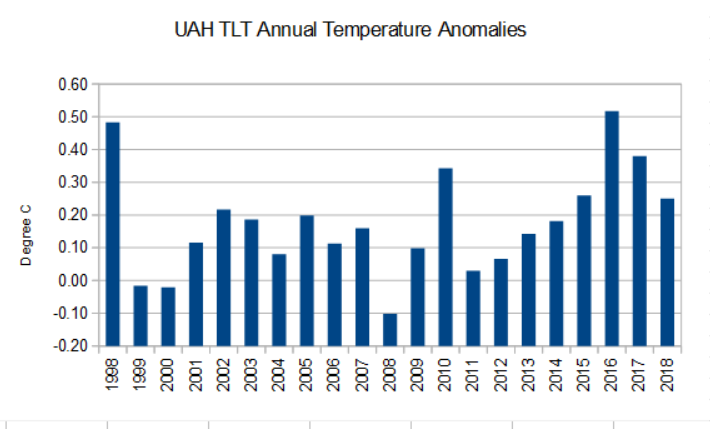 Those, for whom the UAH data is somewhat inconvenient, try to argue that you cannot compare tropospheric temperatures with surface ones, as it is like comparing chalk and cheese. For global observations since the late 1950s, the most recent versions of all available data sets show that the troposphere has warmed at a slightly greater rate than the surface, while the stratosphere has cooled markedly since 1979. This is in accord with physical expectations and most model results, which demonstrate the role of increasing greenhouse gases in tropospheric warming and stratospheric cooling; ozone depletion also contributes substantially to stratospheric cooling. In other words, it was well accepted that tropospheric and surface temperature trends should track each other over time. Defenders of the surface record point out that the various versions tend to agree closely. However, this means little, other than the fact that they all tend to rely on the same data, and that there is a lot of collusion. There is very close agreement in the 19th and early 20thC. Yet there was barely any temperature data at all in those days. It would have been statistically impossible to derive a global temperature from such little data, yet somehow the Hadley Centre, NOAA and NASA all managed to work it out to great detail, and each came to similar results. Coincidence? Another trick played by the alarmists, and eagerly echoed by the BBC, is to keep quiet about margins of error. For instance, although the estimated anomaly for 2018 was 0.596C (compared to a 1961-90 baseline), the actual range could be anywhere between 0.509 and 0.685C. In my opinion, the real level of uncertainty is far greater than admitted. But even on these figures, we can see that statistically 2018 is only tied with years such as 2001. Apart from the record El Nino of 2015/16, there is no evidence statistically that global temperatures have gone up since 1998. When we hear claims of hottest evah, we need to keep in mind that they are based on differences of hundredths of degrees, amounts so small that they cannot even be measured. 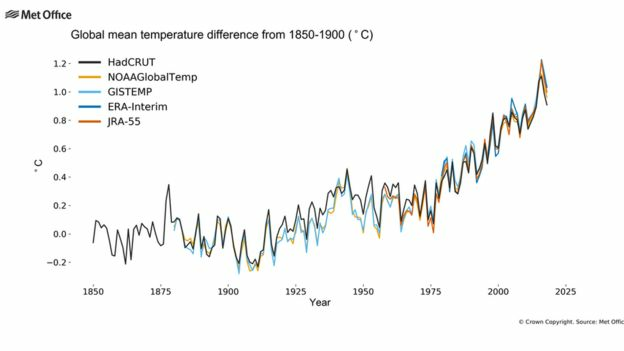 You may have noticed that, increasingly, reports of global temperatures always seem to talk in terms of warming since pre-industrial times, defined as 1850 to 1900. This did not use to be the case. NASA, NOAA and the Hadley Centre all used to report on the anomaly values, sometimes converting to an actual temperature. The predominant use of the rise since pre-industrial stems from the “2C” target formalised at Paris. And the reason is very clear. From a PR point of view, it sounds much more scary. 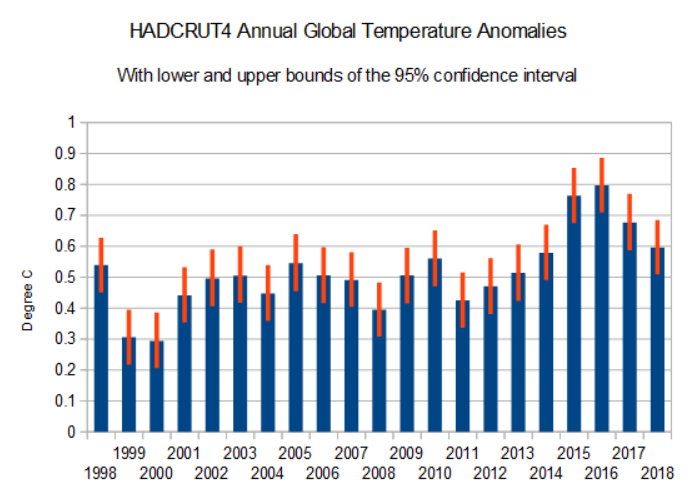 For instance, measured in terms of anomaly from 1981-2010, last years HADCRUT temperature was 0.3C. That would be unlikely to frighten anybody, particularly when it is an impossible job to measure global temperatures to such a degree of accuracy. Moreover, people know full well that their own local temperatures can vary by much more than that on a daily basis. To sell the scare to the public, the numbers needed to be beefed up. Hence talk of 1.5C and 2.0C. The fact that we have already, supposedly, has a full degree of warming since the 19thC, without any deterioration in climate, is neither here nor there. People need to be scared. Yet whenever the BBC or the rest of the media broadcast the latest propaganda, they never seem to mention that the 19th was the end of the Little Ice Age, arguably the coldest era since the Ice Age. I have yet to hear anybody seriously argue that it would be good to return to those cold days of the past. Even Matt McGrath! Sure the beeb scares me, it actually frightens the balls off the nation. I worry about how they’ve been allowed to get away with spreading their egregious lies for this long, it really is so vexing. And yes they are worried in Broadcasting house, in the wet office and across the HMG departments too. Worried in the realization that, it’s too late to ‘wind’ – it all in and pun very much intended. this is the major reason why the great green scam has to be ‘renewed’ (yep not sorry), too much money at stake and notwithstanding the loss of face, the anger might not be too readily contained cost of the bonkers ruinable ‘green sort of but no power drive’ whirlgigs etc………….hence this mad dance goes on, and we know that they know that the whole shebang is a pack of lies. So whaddathey do – wind up the propaganda to evah more idiot scales and bring out some oldies like – ooh look Himalayas gonna melt and the river Ganges, Indus stop flowing and on a loop. Indeed, I heard that numpty weather cutie Paul the weather man Hudson repeat the whopper the other month, prognosticating about a ‘maybe’ T rise of 5ºC by the end of the 21st C! Honesty – there is none, it’s just total and malignant lies but they persist and see above for answer. Yes, but looking across the pond, the US seems, or should I say the Socialist Democrats, have gone even more bonkers with their Green New Deal . Apparently, as of yesterday afternoon, that bill had somehow disappeared. One of the tenets was to get rid of air plane travel within 10 years. It was written by the wunderkind, Alexandria Ocasio-Cortez. Believe it or not, she has a degree in economics from Boston University (it appears to be on par with UEA). Her answer to running out of money is to just print more of it. In fact, his stellar speech left, Speaker of the House, Nancy Pelosi trying to get peanut butter off the roof of her mouth and shuffling her papers. She was reduced to an manner-less toddler. “How many examples of failed predictions, discredited assumptions, evidence of incorrect data and evidence of malpractice are required before the idea of human-induced climate change loses credibility ?” As plagiarized from Ian Plimer’s excellent book Heaven and Earth which I read nearly a decade ago ….. If there is global warming, then it seems logical that each decade should be warmer than the last. In fact it would be newsworthy if a decade was colder than the last under these conditions but not the other way around. Slow warming is not frightening. 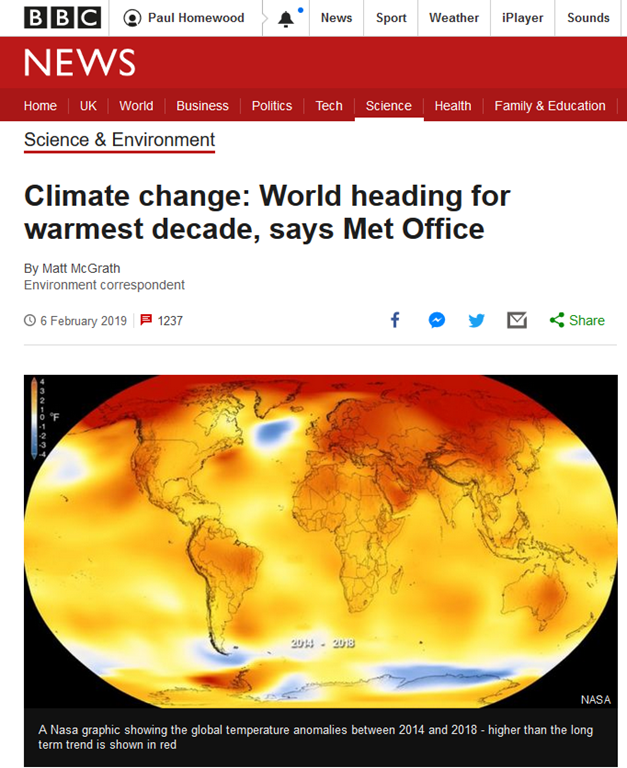 “Slow warming is not frightening”: It is for the BBC and those who have carved out their fortunes (that’s you, Gummer!) – intellectual or financial – on the back of it all. They know the next ten – 30 years is going to be the undoing of their scare (spelt: scam). Leaving the EU will be as nothing compared to the undoing of this nonsense. As Paul says, the baseline was chosen for the good reason that it was the end of a period of serious cold, thus making the subsequent rise in temperature seem much more dramatic. What would the anomalies look like if the baseline was, say, the average temperature over the past two thousand years? I am sure that the increase since the 1850s would then look very different as it would be clear that most – if not all – of it is just recovery towards the norm. Exactly. And at some point the recovery will be complete, or at least will noticeably slow down relative to the last century. We may be at or near that point now, as ‘the pause’ suggests. We’ve little idea of temperatures over the last 2,000 years. What a bunch of **%!*&??s!! It doesn’t matter, he gets a nice regular salary (paid by us). How much to you or I get paid for banging a different drum ? sweet FA !!! I am becoming increasingly irate at the abuse of Confidence Intervals. The IPCC started the trend as a means of making the opinions of their committees seem like science. In proper statistics a C.I. has a real meaning, but when applied to opinions it is pure snake-oil. This was the method used to calculate the Radiant forcing function values, which form the basis for the wonder-models …. no wonder that they are junk! As Paul notes these CIs are far too low and are just a means of making inaccurate numbers seem more credible and scientific: sadly they may work on the intended readers.